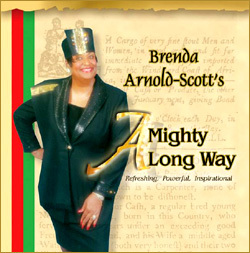 Arnold-Scott’s inaugural CD, “A Mighty Long Way,” is a classic. This effort helped open the door for the Spoken Word genre to be placed in rotation in gospel radio markets throughout the country. With her poetry painted on canvases of her music based on some of her influences like pop, jazz, traditional and contemporary gospel, Arnold-Scott waxes about the history of her people, hope, and healing; and she inspires, teaches, and praises God in a fresh and wonderful style! Make this classic part of your collection today. Cost $15.00.